My First Marathon - 275 days out - Run. Bike. Code. Just a short post today before leaving for a father-and-son-camping weekend. I’ve registered for my first marathon! When I started running again in earnest back in 2012, my inner nerd came up with the idea to run my first marathon at the age of 42. Well, I’ll turn 42 next year and so I registered for my first marathon. 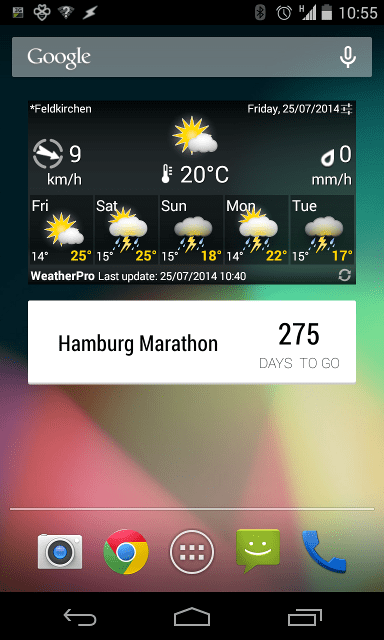 On April 26, 2015 I will thus run the Haspa Marathon Hamburg. By making it public on the blog and with friends and family I’m building up enough peer pressure to actually do it. Today is a good day to post about it, because the day X is exactly 275 days away. If you follow me on Twitter or read my previous 4×7 Review closely, you might have noticed that I’m working with a coach again. I find the idea of running 42.195km/26.2mi pretty daunting and therefore thought it might be a good thing to let a professional develop the training-plan for me. Since the beginning of June I’m a member of the Team All-American led by Coach Scott Fishman. So far, this has worked out very well and I’m confident that Scott will prepare me well for my first marathon. If you want to follow along, you can do so on Strava, Instagram, and of course Twitter. Oh, and I’ll be posting training updates and stuff on this very blog. As always, I’d be grateful for comments and words of encouragement.